Stir pancake mix with pear juice (reserved from the can of pears) to a thin consistency. Add more pear juice if too thick. Mix until well blended. Spray an 8” skillet pan with cooking spray. Pour about 2 tbs. of batter onto pan over medium heat and move the pan in a circular motion to cover the entire pan. Cook until golden brown, flip over and cook the other side till golden brown. 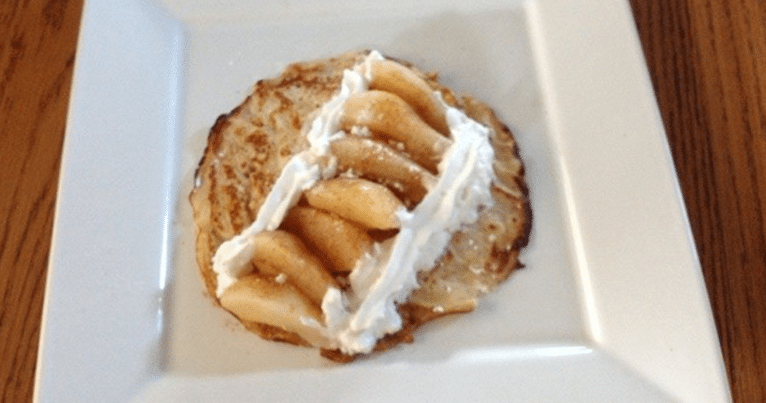 Place crepe onto plate and put pears down the center of crepe. Sprinkle with cinnamon and sugar. Top with whipped cream. Sprinkle with Powdered sugar, if desired. Makes about six Pear Crepes.